Project 636 Stariy Oskol submarine. Russia is ready to give India access to improved Kilo-class (Project 636 ‘Varshavyanka’) non-nuclear submarine construction technology. It has not been decided yet which of two Indian shipyards – Pipavav or Larsen & Toubro – will assemble the submarines under licence. The Rostec CEO Sergey Chemezov first told Kommersant-Vlast of India's interest in improved Kilo-class (Project 636 ‘Varshavyanka’) diesel-electric submarine (DES) construction technology. "We are now coming to an arrangement for them to initially repair previously acquired submarines, in which they will be assisted by experts from the ‘Zvyozdochka’ Shipbuilding Centre," Chemezov said. "Later, construction of the submarines will start at a joint venture between USC (United Shipbuilding Corporation), Rosoboronexport and an Indian shipyard: first the major assembly work, and then the localisation." Industry sources said the option of supplying India with two Improved Kilo-class submarines was under discussion until recently. According to a source, the issue was raised in November 2015 during a visit by Indian Defence Minister Manohar Parrikar to Admiralty Shipyards in Saint Petersburg. The Indian military, however, decided not to buy the submarines ready-made, but to assemble them in India under licence. Organisations involved in arms exports received a request from India for the technology to be transferred and production localised in India. According to a shipbuilding industry executive, negotiations are on directly between the Russian and Indian governments, underlining the "special status of the relationship between Moscow and New Delhi". Kommersant has learned that the main issue lies in the choice of Indian partner. India's non-nuclear submarine fleet is in urgent need of modernisation, and it is not clear which local shipyard is capable of carrying out the work soonest. 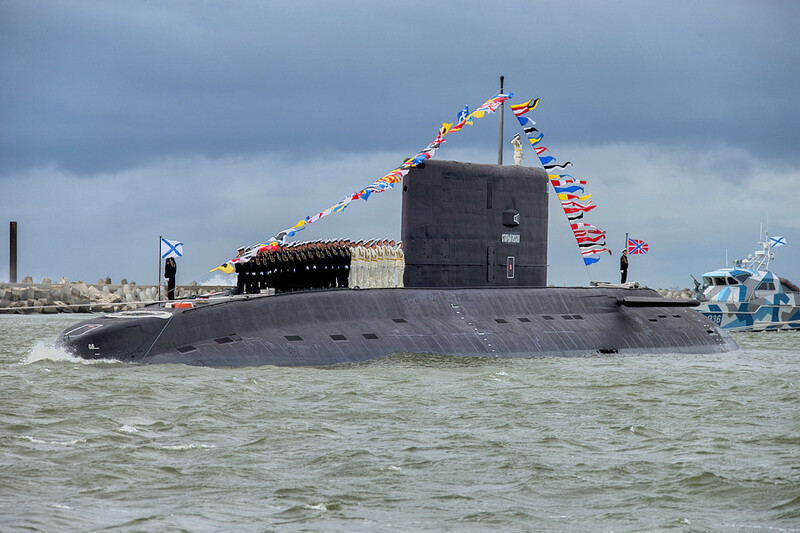 The Indian Navy currently has just nine Russian-built Kilo-class (Project 877EKM ‘Paltus’) DESs and four German-built Type-209 ‘Shishumar’ class submarines. The former have a service life of 25 years, which is over for the first six Indian DESs. For the remaining three the service life gets over in the next ten years. Repairs to the Kilo-class submarines are carried out at the ‘Zvyozdochka’ shipyard in Severodvinsk, where five such Indian submarines have been refitted since 1997, and Admiralty Shipyards, where two such submarines have been repaired. The ‘Sindhukesari’, which entered its 28th year of service in 2015, is currently at the Zvyozdochka shipyard. Built by the Leningrad Admiralty Association (now Admiralty Shipyards) in 1988, it underwent first intermediate maintenance and upgrade there, from1999-2001. Of the ten Russian-built Kilo-class submarines, nine are in operation; one of them, Sindhurakshak, exploded at Mumbai dockyard in August 2013. After a second round of maintenance, their service life could be extended by another ten years, which experts see as a sign of the reliability of the design. However, the Indian Navy has acquired no new DESs in the last 15 years. Meanwhile, India's geopolitical rival, Pakistan, ordered eight advanced Type 041 non-nuclear submarines from China at the end of 2015 (of which four will be built in Karachi and the rest in China). India is being offered a hybrid option, with construction of at least one Improved Kilo-class submarine at Russian shipyards: with testing, it takes up to three years to build one submarine of this class. To develop such facilities in India would take "significant time", said a source. "They want to acquire the new submarines as quickly as possible." Kommersant understands that possible shipyards for the joint Indo-Russian venture are the privately owned Pipavav, part of Reliance Defence enterprises, and Larsen & Toubro. Sources close to the negotiations said the owner of the former, business magnate Anil Ambani, has strong lobbying powers with the Indian government, and direct access to Prime Minister Modi. From a technical point of view, the latter is more favourable for Russia, but India's military and government officials will put together the final proposal. "Of course, it would be more beneficial to us to sell the submarines without transferring the technology, then we would receive 'hard' cash," said a high-ranking official involved in military technical cooperation. “But the system has changed. Everyone wants access to reproduce the product, not to make one-off purchases. And we have to give that access, otherwise we will lose the market."